The iconic genderless hat is enriched of an even more trip-addicting details. Doria 1905 heads to a new trip which is the movement.You can roll it, unroll it, put it in your pocket, and finally: pull the hat out of the bag! The idea of the journey continues and evolves its shapes, exploring new dimensions and contexts. Wore by explorers and globetrotters, the Doria hat is an inseparable mate for the journey; it is practical, increasable, rollable, and unmissable. Doria 1905 makes the idea of the journey modern, keeping in mind the visionary portrait of Lewis Carrol; and completing the unisex collection, it also draws a micro-selection of bags whose purpose is to transport its trip mate easily and with style. The hats of the collection are conceived and made considering the perfect fit with their special bags. Doria 1905 expands its creative course in the world of the accessories, beginning with practicality in order to end with a product in harmony with the stylistic choice of the brand. The unisex and timeless spirit of the brand are eradicated in the bag’s DNA, whose design and production are in the hands of the young designer, Alberto Olivero. The backpack SKUBA, the bag OCEAN, the shopper HEVA, and the ROLL BAG have a common detail: carrying and preserving the hat’s shape with protective solutions, which are apparently appealing and, moreover, they can also become independent accessories. 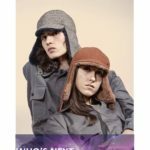 They are realized with a mixture of velvety materials, impermeable leather of nappa, chamois and details of multitoned zip; they open the bag up, revealing the unexpected and hidden pockets that are created to transport the hat. The hats can be folded, but they don’t rub; they are impermeable; they are decorated with details that make them easy to wear, keeping the uptodate, classy-sport touch and without modifying the concept of the brand. They are made with different colors, they are bright, joyful and sophisticated. The hats of this collection are extremely unisex and they play with the luxurious materials such as combed velour, the felts in cashmere and lapin, paillettes, eco-pony, naplack and soft eco-furs; but they are also made of practical material such as resin, soft nets, impermeable felts, and the unmissable double “capsule” of “Thindown” light duck hairs which opens up to new colors. Lead, Smoke, Caramel, Mou, black Saraceno, Negramaro, Ink, Lacquer, Pomegranate, Pumpkin, Petroleum, Night blue, Brick, Wisteria, Oyster, Rock, mixed together in the palette which draws a rich collection of colors. The sensual, elegant, and pure shapes come back with shameless and young forms. The “Futurist” inspiration of this collection is tangible in every detail; in the reckless innovations; in the powerful colors; in the research of unusual materials, simple and dynamic shapes; and in the constant analysis of the practicality. The recall of Ernesto Michahelles is particularly strong. He is known with the pseudonym Thayaht and he created the unique and versatile item, his overall. It perfectly matches the practicality that Doria 1905 has at its heart. For the centenary of this creation, the photographs of the catalogue of the season FW 19/20 will be dedicated to the first example of workwear in the history of the Made in Italy (whose denomination comes exactly from 1920). The workwear is a product created to favor the movement, the emancipation, the achievements, and the work towards the construction of a brighter future. Thinking of the Made in Italy of the brand, the items are chosen in order to partner the hats in the photographs; the authentic overalls of the historical Casa della Tuta in Turin; and the “safety” shoes, of great esthetic impact, by Dike in Padua. TOODORIAis the capsule by Doria 1905 that wants to emphasize specific and distinctive characteristics of the brand through “outsiders” and innovative items. The “Toodoria” approach to the innovation of the product is based on a continuous experimentation and a new and transversal contamination. After experiencing the application of piercings, chains, and zip on the hats from the past collections, now Toodoria focuses on the co-branding in a season where the bag is contaminated by the reinterpretation of the hat by the designer Alberto Olivero. The product is a projection of the characteristic traits of Alberto Olivero’s bags on the hat which transforms it in a container with pocket and details from the world of the bags. The product’s innovation, the experimentation and the cross-contamination rigorously Made in Italy establish the foundations of the Toodoria.